What distance do I have to leave between rods to hold each bottle? 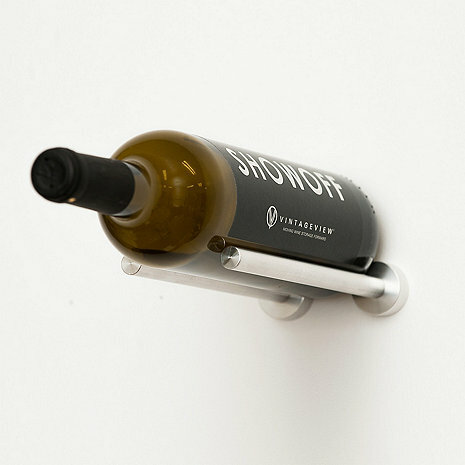 BEST ANSWER: The VintageView Vino Rails have to be 2 1/2 inches apart to hold a bottle. I have attached a pdf with detailed instructions. It just depends on the size of your bottle however we left only 3 inchesEnter an answer to this question. I used 2 1/2 inches, both for the spacing of the rails for each bottle AND between each set of rails. Do these come as pairs? BEST ANSWER: The VintageView Vino Rails do come as a set of two and each set holds one 750ml or 1.5l bottle. these look great my basement by the wet bar. I put them under the built-in cabinet where one set holds a bottle of wine and the other holds wine glasses by the stem.